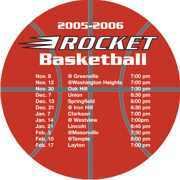 Custom Sports Schedule Magnets Personalized in Bulk in Full Color. Promotional, Inexpensive. Budget Prices in America. 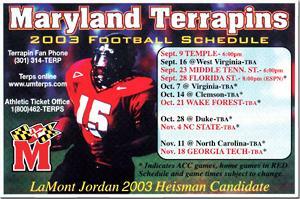 Bulk custom imprinted sports schedule magnets at the Budget Prices in the USA and Canada: football schedule magnets, baseball schedule magnets, basketball schedule magnets, soccer magnets, etc. We supply many other shapes, such as football helmet magnet, golf ball magnet, baseball magnet , etc. : contact us for pictures and pricing. You could use an unlimited number of colors or even a color photo. Free artwork design. We will provide a proof for your approval before production. S1: Rectangle 4" x 7"
S2 : Rectangle 4" x 6"
S4 : Football 4 1/4" x 6 3/8"
S5: Basketball, Baseball or Soccer 5 3/4 Diameter. Prices below include your full color custom imprint. You may order any quantity over the minimum. Setup Charge per order: $35.00; no Setup Charge on repeats. Production Time: 7 days after art approval. Contact us for faster delivery.